For generations, millions of moviegoers and fans alike have rejoiced and celebrated the Star Wars franchise, one of the biggest and most recognizable names in all of science fiction (rival only to Star Trek). From the original film saga (Episodes IV, V, VI) to its prequel film saga (Episodes I, II, III), and to the start of its new film saga (consisting of Episode VII, VIII, IX), the legacy of Star Wars has grown, captivating many with its epic sci-fi universe of space pirates, aliens, stormtroopers, droids, and the Jedi, with the elegant lightsabers for a more “civilized age” and their mystical omnipresent lifestream power “The Force”. Beyond the core roman numeral feature films (seven out of nine currently produced), the Star Wars brand has endured and flourished, branching out to many (and I do mean many) other media outlets in order to expand its own universe. From comic books, to video games, to animated TV shows, and a plethora of book novelizations, which some have been accepted an official Star Wars cannon and some that have been have been dismissed as “Legends” aka non-official Star Wars cannon (a result due to Disney acquired Lucasfilms and the Star War franchise. With the success of Episode VII: The Force Awakens (and with Episode VIII coming out at the end of 2017), Lucasfilms (under Disney’s ownership) and director Gareth Edwards present the very first theatrical spin-off film of the Star Wars universe with the movie Rogue One: A Star Wars Story. Given its inherit hype and being one of the most talked about movies of all 2016, does this non-episode Star Wars entry deliver being a grand spectacle or is it a failed prequel spin-off that’s a far cry from a galaxy far, far away? The old republic is no more, the Jedi have fallen, and the imperial might of the Empire rules the galaxy. Galen Erso (Mads Mikkelsen), a scientist who turned his back and served his connection to the Empire, finds his peaceful farming life abruptly cut short when Orson Krennic (Ben Mendelsohn), Director of Advanced Weapons Research for the Imperial Military, finds him, demanding that he complete his on work on the Death Star, which is being constructed under the supervision eyes of Governor Tarkin. Agreeing to this, Galen leaves behind his young daughter Jyn (Felicity Jones) and is adopted by the extremist Saw Gerrera (Forest Whitaker), who raises her to be a fighter. Years later, a rebel spy named Cassian Andor (Diego Luna), is tasked by the Rebel Alliance’s leader Mon Mothma (Genevieve O’Reilly) to find Galen, tracking news that the Imperial pilot Bodhi Rook (Riz Ahmed) has brought a secret message to Saw, detailing Galen’s work to build fatal flaw in the Empire newest weapon, which is nearly completion. Breaking Jyn out of prison, Cassian and the robot K-2SO (Alan Tudyk) hope to find the missing scientist, but end up partaking in an elaborate and dangerous plan of a rogue squadron of rebels, which includes Bodhi as well as a blind monk Chirrut Imwe (Donnie Yen), and the warrior Baze Malbus (Wen Jiang). With the fate of the galaxy in their hands, Jyn and this small band of rebels eventually becomes aware that it’s up to them to infiltrate an Imperial outpost and steal Galen’s Death Star’s data before the Empire figures out their plan. I’m not super huge nerd fan of Star Wars, but maybe I’m like a “conservative” nerd fan of it. I don’t outwardly show it with wearing fan apparel, going to Star Wars conventions, or collecting collectible poster / trinkets (i.e. the infamous Darth Vader waffle maker, the Yoda cookie jar, or the Chewbacca coffee mug, etc.). If you are one of these fans, then great…good for you (more power to you for being a dedicated fan), but it’s just not me. However, that being said, I’m very interested in Star Wars universe. Yes, I do love the core “Episode” movies, but I do like how the franchise is expanding beyond them, branching out to explore many different avenues within this sci-fi universe. Basically, its build upon the Star Wars mythos, introducing us (the viewer) to many wondrous tales, exciting adventures, and creative characters that populate the galaxy and presenting them in unique mediums such as books, video games, and graphic novels. Yes, I do have mention that still love playing Star Wars: Battlefront II for the PS2 (such a great game). In addition, I’ve seeing some of the animated shows (Star Wars: Clone Wars and Star Wars: Rebels. I’m just starting season two of Rebels) and I’ve only read one of the Star Wars books (Aftemath: Star Wars: Journey to The Force Awakens) and I did like, so I might have to check out a couple more (when I have free time. I’m a bit backed up on my reading list currently). Of course, like many out there, I remember hearing that the news when Disney bought Star Wars (Lucasfilms) and that they were going to do movies beyond the “Episode” features; a sort of spin-off theatrical films. To be honest, I was a bit skeptical about this notion. I mean the initial announcement details for Rouge One: A Star Wars Story was interesting (i.e. what the film was going to be about), but I had my reservations, believing that it was just way for Disney to cash in on the success of such an illustrious and beloved franchise to many. However, after seeing several trailers for the movie, my lingering doubts faded away and inner fanboy anticipation began to rise. With so much heightened promotion for the film and excitement building for most of the 2016 year, the expectations level for Rogue One were unprecedented to deliver the first entertaining theatrical spin-off Star Wars movie. Well, what did I think of it? Was it worth the hype and anticipation? Most definitely! Rogue One: A Star Wars Story is incredible awesome and a must for both causal / diehard fans to the Star Wars universe. Rouge One is directed by Gareth Edwards, who’s previous directed such films as Monsters and the recent 2014 Godzilla remake. Given the film’s budget of roughly $200 million and with so much anticipation for this movie to deliver, Rogue One represents Edwards biggest film to date. Luckily, Edwards delivers, producing an awesome and entertaining Star Wars spinoff feature that just as palpable as the core “Episode” films. With a visual background in his career, Edwards seems to have a good grasp on Rogue One, which, like the rest of the Star Wars movies, are treated as big blockbuster features, handling a vast array of visuals effects, expansive layouts, and intricate action scenes. With a clear direction, Edwards is also respectful to the franchise’s legacy, keeping up expectations in honoring past features, while also branching out to bring something new and different to the Star Wars table. I remember hearing all the reports and rumors (via the internet) that Edwards had to extensive reshoots for Rogue One, which sometimes can be problematic for the movie itself (and its pre-release publicity). However, the film’s final product is excellent, with a focus measure on the main narrative at hand that builds to a powerful and thrilling third act crescendo with little to none moments that feel superfluous or goes off on a tangent. Although, if you notice, that a lot of scenes from the film’s trailers didn’t make it into the film’s final cut. The perplexing notion about Rogue One is that while’s its considered by many (myself included) as the first standalone movie, it isn’t exactly that. I know. As an I said, perplexing. In truth, the film functions as a direct prequel to A New Hope, laying the groundwork and building up events to the opening scene of Episode IV. Like many other prequel movies produced by Hollywood, this tactic is a tricky, one that has plenty of familiar terrain / continuity for fans, but means that the movie itself (the prequel) might tread too much that it won’t discern itself, creating a hollowed attempt to recapture the magic of the original material. Luckily, Rogue One doesn’t do that, with Edwards, along with screenwriters Chris Weitz and Tony Gilroy who work on a story written by John Knoll and Gary Whitta, find a sort of tightly woven balance with old familiar Star Wars staples and nuances, while also giving Rogue One its own on the Star Wars legacy. Edwards does break a few cinematic nuances that are common in a Star Wars features, including no opening title crawl (Rogue One still uses “A long time ago in a galaxy far, far away…” text as well as the same style end credits), time jump / flashback scenes, and on-screen texts, which is helpful as this movie uses plenty of different locations (planets) in the Star Wars universe. In addition, the main narrative of the “Episode” movies usually center around the fantasy motif elements of the Jedi, their lightsabers, and of The Force. Rogue One, however, discards the most of those nuances (mentioning them here and there), but none of these characters are Jedi (save for Darth Vader, who is technically a Sith) and make the feature work ground in a more “in the trenches” war sci-fi flick. Thus, it’s kind of sort of “breath of fresh air” with Rogue One taking on this type of story, building upon the idea that not every Star Wars film needs to incorporate a Skywalker (Anakin, Luke, and maybe possibly Rey. If you believe the rumors about her.). However, echoing to what I said above, all of this helps Rogue One stand both apart from the roman numeral Star Wars films, but also within an arm’s reach of them (one foot in, one foot out). 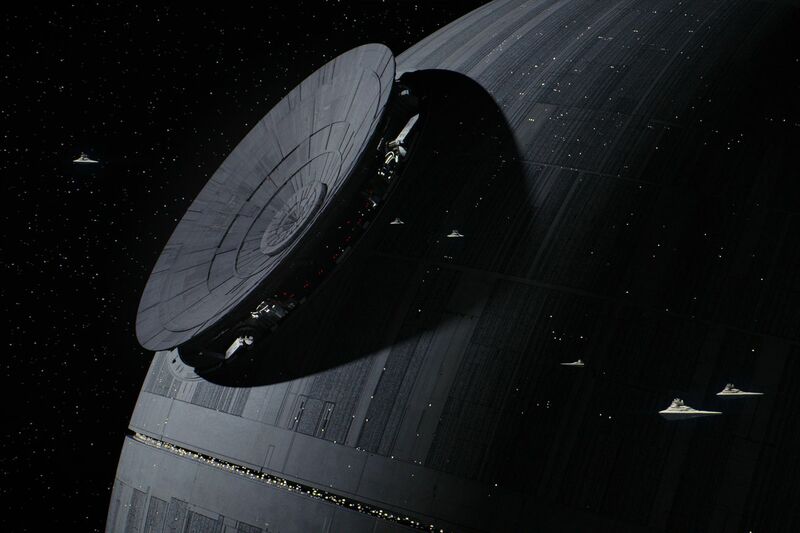 On a technical level, Rogue One is absolutely gorgeous and well-crafted. The film’s visual effects are impressive, offering up plenty of CG sci-fi flair throughout the movie from locations to space battles, which is excellent and kind of reminds me of the space battle at the end of Return of the Jedi. While the visual effects are slicks, Edwards, like J.J. Abrams on The Force Awakens, doesn’t let the visual overtake the movie, utilizing a lot of practical elements in set locales, costumes, props, and make-up. The various creature design for the Rogue One is also worth mention as I felt my eye wandering beyond the main characters in a couple of scenes to take in a few of them in the background. I have to say I was pretty impress with how they look. In addition, all the new planet locations are also cool, with the planet Scarif being the prime example as a tropical paradise setting that’s juxtapose with the massive battle scenes of the Stormtroopers vs. the Rebels. As a side note, Rogue One also represents the first film that Star Wars film composer John Williams with current popular soundtrack composer Michael Giacchino stepping in to score the film. Giacchino’s work is great, with plenty of Williams’s iconic melodies being echoed throughout the film, but like The Force Awakens, doesn’t have a profound signature melody that’s attached to Rogue One. The cast in Rogue One is another one of the film’s strengths, with a very likeable group that’s easy to invest in without extra baggage (i.e. building up / saving character moments up to be carried on in another film like in the “Episode” features). Actress Felicity Jones, known for her roles in The Theory of Everything, Inferno, and the upcoming film A Monster Calls, plays Jyn Erso, the somewhat main protagonist in the movie. Jones holds her own as Jyn, tough, young and, determined woman who is haunted by a traumatic childhood past, providing a strong character who works well for the film’s main storyline as well as other nuances to the movie. Plus, it’s nice to see a female hero character (similar to Princess Leia from the original trilogy) takes center stage and actively participate in the film’s action scenes. Behind Jones’s Jyn is actor Diego Luna, who plays the rebel captain Cassian Andor. Luna, known for his roles in Milk, Elysium, and The Book of Life, plays Cassian with a mixture of a steely determination and unease, as we see the Rebel captain conflicted with some of the actions he must face. He’s not your typical male lead character, which makes Luna’s Cassian Andor very intriguing. I kind of hope that they make a novelization on his character’s backstory. Now that would be something quite interesting to read about. The rest of the “Rogue One” crew deliver solid performances from the actors who portray them, but are, more or less, one dimensional, which, given the amount of new characters in this “one and done” type spin-off movie, is not a bad thing and pretty understandable. Each one is given a moment to shine on-screen and brings their own inherit charm to their respective characters. Donnie Yen and Wen Jiang are both terrific as the blind monk Chirrut Imwe and the heavy blaster toting warrior Baze Malbus (the pair have great chemistry and some funny banter), while Riz Ahmed plays the twitchy, yet likeable defector Imperial pilot Bodhi Rook. Lastly, as supporting side characters, actors Mads Mikkelsen and Forest Whitaker plays the Imperial weapon designer Galen Erso (Jyn’s father) and Saw Gerrera, an extremist character, who’s veteran of the Clone Wars, and who has appeared in several Star Wars side projects. In respect, both Mikkelsen and Whitaker do a good job in their roles. While the main heroes of Rogue One are strong and (like I said above) very likeable and charismatic, the true standout role of the group is K-2SO, a reprogramed Imperial droid who works with Cassian Andor. In a sense, this character is somewhat of a distant cousin to C-3PO, channeling the same amount of analytically statistics, but with splash of dark humor and more blunt approach. Voice by Alan Tudyk, who voices the character wonderfully, brings a lot of comic relief to the movie and a very endearing and probably one of the most memorable characters in all of Rogue One. 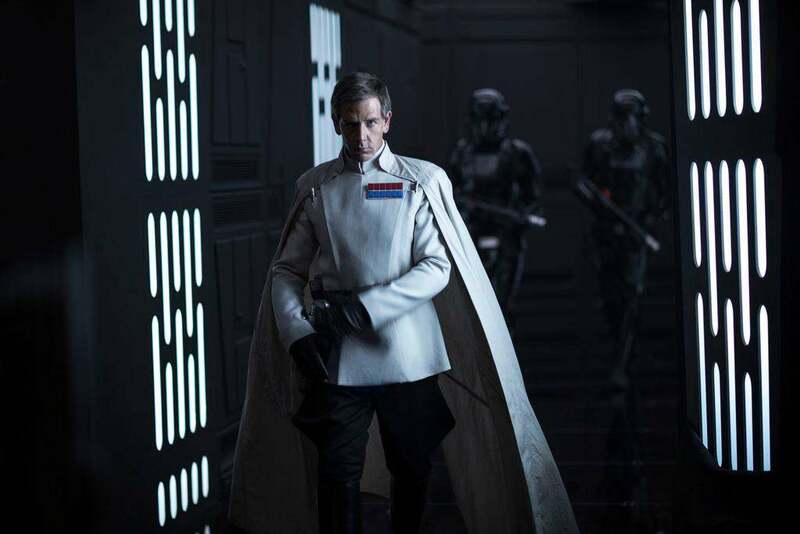 In the villain category, actor Ben Mendelsohn plays Rogue One’s main antagonist Director Orson Krennic. While he’s no Darth Maul, General Grievous, or Boba Fett, Mendelsohn’s Krennic is great with a wonderful smarmy attitude (capturing that somewhat classic Imperial portrayal) and works for what the films needs him to be. Of course, one of the most talked things in Rogue One is the appearance of Darth Vader himself, voiced once again by the legendary James Earl Jones. While his screen time is kept to a minimal (acting more like a cameo appearance in Rogue One), his inclusion in this movie is a great and definitely adds to his character’s mythos to the franchise in some dramatic and chilling ways. Thus, don’t expect Vader to being the central villain in Rogue One. Personally, I totally geeked out when I saw the character once again on-screen even if it was for a short time… super awesome! This, of course, leads into all the numerous Easter Eggs / references that are scattered across Rogue One. With the story tying into the start of A New Hope, many familiar characters make small / cameo like appearance, including Jimmy Smits return as Bail Organa (a nice tie-in nod to the prequel trilogy saga) and Genevieve O’Reilly Rebel Alliance leader Mon Mothma (who previously played the character in Episode III: Revenge of the Sith, but her scenes were cut from the final version of the film). There are few others out in the movie (as well dialogue lines and references), but I won’t spoil it for you guys. Just be on the lookout for them. Of course, even with my high praise for this movie, I do have a few minor nitpicks for Rogue One that I must address. While I did mention that the overall characterization for most of the “Rogue One” crew are not exactly well-rounded, some of the important reasons behind their motivation for joining the team is glossed over, most notably in Bodhi’s motivation on why he (an Imperial pilot) defected to the Rebel’s side. Its mentioned briefly and somewhat glossed over. Then there is one particular character from Episode IV: A New Hope that makes an appearance in Rogue One. I’m not going to spoil who it is, so let’s call him “Character X”. While Character X’s inclusion in the movie is neat and adds to the continuity to where Rogue One stands in the official Star Wars timeline, his appearance was created via digital effects and (unfortunately) doesn’t hold up. While I do applaud the visual effect team for creating a detailed “digital copy” of this character (like I said it was pretty cool to see Character X again), but this animated rendering of Character X seems off, especially in his facial expression, when paired up against real-life actors, which can be a bit distracting on-screen. Maybe they could’ve a found an actor who looked like Character X to fill the role, instead of choosing a very obvious CG rendered recreation for him. I don’t know…I guess maybe that visual effects technology is not up to the high standard that many moviegoers (myself included) are expecting see. Again, these are all minor nitpicks that really didn’t take away from my overall enjoyment of the feature. 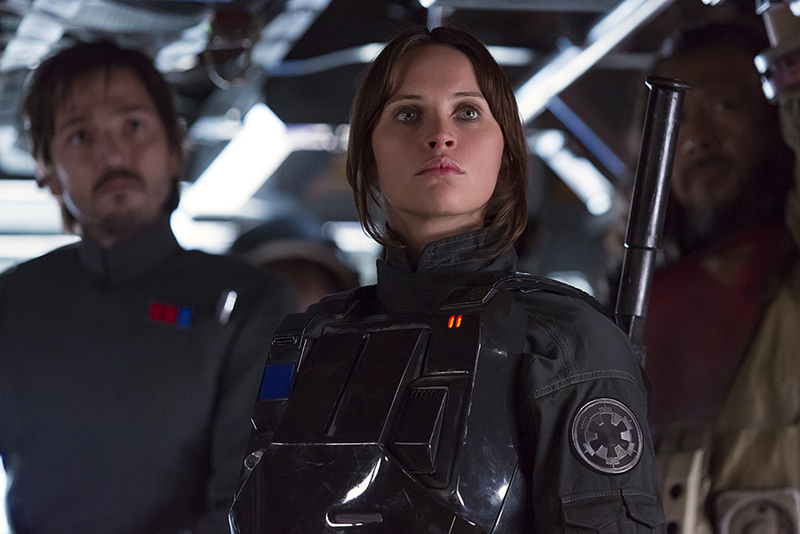 Jyn Erso and crew of Rouge One venture deep into enemy territory to save the galaxy in the new movie Rogue One: A Star Wars Story. Director Gareth Edwards first spin-off film to the popular franchise succeeds on multiple levels, serving up plenty of fan service moments, but also honors film sagas’ past and present (with Episode VIII and IX coming out in following years) as it paves its way for the future solo movies. With a plethora of action, tension, drama, and overall blockbuster fun (without it becoming mindless), Rogue One is an excellent way to recapture the old Star Wars magic in a compelling, edgier, and theatrical way. Yes, there’s some minor nitpicks to be had, but the positive definitely outweigh its minuscule negatives. Personally, I loved it. I’ll even admit it that I like it more than I did The Force Awakens. It was entertaining, engaging, and dramatic, and (basically), it was everything I wanted from this movie and then some. So, of course, I going to give this film my highly-recommended staple of approval. Whatever you take away from this movie, there’s no denying that Rogue One: A Star Wars Story represents the start of the something new and exciting for this beloved sci-fi universe, showcasing that, if Lucasfilms (Disney) keeps these movies fresh and creative (and not just a quick big dollar cash and grab), then these spinoffs theatrical films will have longevity long after the roman numeral entries are done and completed. thanks for the review…kinda with you on how the film isn’t completely standalone, as it ties in with A New Hope and also relies on references from Roman-numeral Star Wars films; maybe one would be tempted to watch this movie’s ending and the beginning of Episode IV back-to-back in that order? Thanks for the comment. Yes, I do remember Character X in Revenge of the Sith and it was played by a different actor. However, its pretty obvious that Character X was digitally created in Rogue One and kind be a bit distracting (because its mostly human characters that Character X is interacting with).. Also, the character of Mon Mothma was casted by someone else (the actress would played her in the deleted scenes in Revenge of the Sith) and wasn’t digitally created. So I while Edwards’s intention were noble, the digital rendering of Character X just comes across as a bit wonky. I just saw this today and it exceeded my expectations. Thoroughly entertaining and worthy of the far far away Star Wars galaxy. De-Lucassing the francise has done it a world of good. Thanks for the comment. I’m glad that you liked it. It was truly a great film. Strong, strong film, and I agree that this is not a true standalone, in fact, as I said in my review, this feels like the first half of A New Hope that we never realized we missed out on. Han Solo, on the other hand, will be between Episodes III and IV, and will really be a better look at a character based standalone as I’ve not heard of any other “moments” to be explored yet, just persistent rumors for Fett and Kenobi spinoffs. Thanks for reading it and thanks for your extensive detailed comment! Love it. Yeah, Bodhi’s reasoning was explain in the movie, but it was kind of quickly mentioned (kind of wanted something more). I did hear that Giacchino only had 4 weeks to score the film, but I just forgot to mention it in my review. Still, it was good music. Kind of felt like Williams music from the original trilogy. All in all, I loved Rogue One and I’m glad that you did as well. Your rating almost makes me want to see it but I’m not quite there yet 😉 Great all-encompassing review!